Many parents have long held the belief that once a child is 1 year old, it's okay to turn his car seat front-facing. However, the American Academy of Pediatrics (AAP) recently released some new guidelines that may change the way some moms and dads approach securing their children. The new policy appears in the April issue of Pediatrics, and recommends that youngsters remain in rear-facing car seats until they are 2 years old. 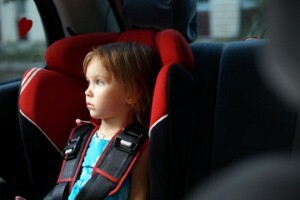 Around 1,500 children under the age of 16 die in automobile accidents each year, and the AAP says that keeping children in rear-facing seats can help reduce that number. The reason for the change comes from the fact that the chances of a child sustaining a severe injury is about five times greater in forward-facing seats than rear-facing seats, which distribute the force of a crash over the entire body. "Parents often look forward to transitioning from one stage to the next, but these transitions should generally be delayed until they’re necessary, when the child fully outgrows the limits for his or her current stage," said Dennis Durbin, the lead author of the policy. Though they changed their stance, Durbin reminds parents that turning 2 years old is not a hard deadline, and smaller children can still benefit from rear-facing seating. He added that children should remain in the back seat until they reach 13.